Traplight Creative Director Sami Kalliokoski took part in an interesting panel in Casual Connect USA on 17th of January. The panel dived into how to make safe, easy and fun games that both kids and their parents can enjoy. Check out below Sami and Traplight’s take on some of the topics discussed in the panel. You can also watch the full panel discussion in YouTube! It has become clear to us at Traplight through our own experiences and by looking at current industry trends that User-Generated Content games are super interesting for kids. Because of the high interest towards creating, monetising UGC games comes naturally through the creation elements. Big Bang Racing became popular with kids a bit by accident, but if we were to focus more on making games for kids, we would also put a lot of effort into creating interesting and fun collection mechanics that have been proven to work great in games targeted towards younger audience. The nature of User-Generated Content games means that players are able to basically create whatever they like. This makes it a challenge to control the content players create and to keep underage players safe. In Big Bang Racing players can give thumbs up or thumbs down on the created content, much like in social media, and the community is able to quickly hide offensive or not-kid-friendly content. There are also basic bad word filters in place to make sure that the names of levels, players or teams are not offensive. We would also like to highlight the importance of parents playing with their kids: a UGC game can be a kid’s first touch to social media like social interaction, and having a parent there will help them learn how to behave when interacting with other players and the content created by them. When it comes to virality, our games rely heavily on the inherent social aspects of User-Generated Content: When you create something you also want to share it with others. In addition Traplight focuses on influencers to make our games visible in social media and YouTube. We put effort into making streaming and video creation easy inside our games. This will help influencers to create content for their fans, and also the players who just want to share their experiences with friends. We also add features that will help influencers create fun and engaging content utilising the User-Generated Content in our games. Influencers aren’t just looking for a steadily growing number on their subscriber counter. To make their channels feel alive influencers prefer fans that are active to comment, like and share, and are eager to engage in activities set up by the influencer. Without sociality, the channel can soon feel dead, and not tempting for new fans to join in. Gaming YouTubers have many solutions to get ahead – personality, different game genres, humour, skills – but it’s still a constant fight to find something that not every other channel is showing as well. We give value to YouTubers with our UGC games. These things include building special features for them inside our games, giving them unique content that no one else has, or bringing them in on the game’s development process early on to provide feedback. Our goal is to not only make our products highly ‘YouTubable’, but also give value to influencers, their channels, and their fans through our games. This blog post was published in Influencer Update as a guest author article. Check it out here! Can You Merge Social Media and Free-to-Play Games in a Monetizable Way? User-Generated Content is often associated with social media, where all posts, shares, and comments are user created. However, UGC is no stranger to games either – level editors and modding has been a common occurrence in games for decades. At Traplight, we see UGC as enhanced player autonomy – an increased pool of choices and possibilities the players have in the game. That autonomy starts with how you control the game and create your unique playing style. The playing style as such is rarely cited as UGC. But when you look at, for example, placing points on talent trees to twist game mechanics, customizing characters and all that express our identities as players, it is not so clear where the player choices are UGC. This is especially true in social F2P games. The same goes for user-created characters, storylines, and tactics that become popular. In Clash Royale, Supercell has named decks after players who started using a particular unit combination in a successful way. “Jason’s Deck” became popular after his win at Helsinki Tournament in 2016. While UGC has been a big part of games for a long time (in the form of autonomy), there is one question that divides UGC games into two main categories. This question is about how UGC is used in a game: how does the created content help the content creator achieving their goals in the game? We have identified two-high level approaches to UGC games: Player Centric UGC and Creator Centric UGC. The first approach – which we call Player Centric UGC – is the more popular one of the two. It is used through enhanced player autonomy to give the players an edge over another, via strategic city layouts, counter-decks, and tactical character synergies. The signature of this approach is direct competition between the players. In other words, players customize their gameplay to win. Thanks to the success of this approach, there is a high population of city builders, RPGs, and MOBAs in the mobile F2P market. The second approach – which we call Creator Centric UGC – is used to gain social validation. Instead of optimizing player power to win, the creators use their enhanced autonomy to craft enjoyable gameplay experiences by setting flow, pacing, elements of surprise, and unique visuals of their creations. If they succeed in entertaining other players, they receive likes that convert into other rewards. In this approach, players create content for other players’ enjoyment – much as game developers do. Big Bang Racing – with it’s 8 million player-created tracks – was born from this approach. These two high-level approaches have different end goals. The player-centric is aiming for power through winning and is rewarded by more power and higher social standing (leaderboard, rank) based on your success. The latter aims for social validation and is rewarded by increased social influence and size of an audience. Large audience grants players a possibility to start their own trend in the game – an achievement that is comparable to having a deck named after you in Player Centric UGC. In Big Bang Racing, the level creators receive likes from other players. Top creators have tens of thousands of in-game followers. The Creator Centric UGC has lots of similarities with UGC in current social media. They both rely on people delivering interesting content, giving and receiving social validation, and growing a following. They both also allow opportunity for becoming an influencer, much like streamers in YouTube and Twitch, but inside a game, by providing your unique content to your audience of other players. In Big Bang Racing, the highest rated creators have tens of thousands of followers. But in social media, there is no direct way to monetize you UGC content creation process. This is because the content creation tools – cameras, cell phones or animated gif makers – are external to social media platforms. The camera and the skills used to take great pictures for Instagram or Facebook, attracting thousands of likes, are external to the publishing platform. In UGC games, the content creation tools are internal to the game, creating a new kind of potential for monetization. Here lies the unique puzzle in UGC gaming – how to monetize player creation process and longing for social acceptance. Our Community and Marketing Manager Veera Rouvinen was recently interviewed for the influencer marketing focused website InfluencerUpdate.biz about the interesting and successful YouTuber campaign we built for the launch of Big Bang Racing. 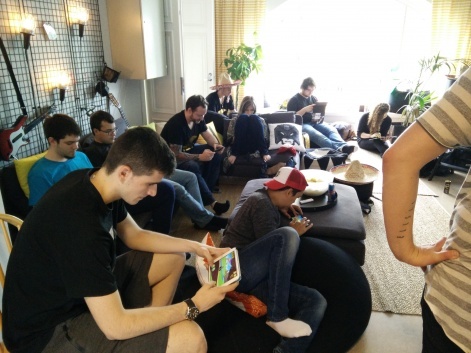 In short, we organised a pre-launch party for our game Big Bang Racing on June 27th 2016, and invited a group of YouTubers from USA, Spain, Netherlands, Norway and Croatia over to test the game. We asked them to give us feedback on how to improve the game, and to make it more ‘YouTubable’. We got great results: amazing feedback and valuable info that we wouldn’t have gotten without hanging out with these people face-to-face. The relationships we built with the influencers and the learnings we got about how they work are super valuable to us. In addition we were able to find new ways to work with the influencers, and to provide them and their channels value for example with custom in-game items. YouTubers focused on testing Big Bang Racing at Traplight office in June 2016. We wish Merry Christmas, Happy New Year and Amazing Holiday Season for all of our friends in Finland and abroad. Thank you for sharing the year 2017 with us. For us, 2018 will be full of exciting things, and we are ready! Please join us for the ride. We had a traditional Finnish “Little Christmas Party” (pikkujoulut in Finnish) on 15th of December. The program of the day included going to sauna, the Friday Open Mic meeting where the teams shared their current progress, Secret Santa gifts, gingerbread baking competition, Mexican bingo, Stiga Table Ice Hockey tournament, decorating the tree with our own UGC decorations and of course some delicious food and drinks! Thanks to the whole Traplight team for an awesome party, and for the amazing year 2017. We worked hard to create new teams, new games and new ways of working, and we are excited now to see things move forward. Let’s make awesome things happen in 2018! The UGC tree and Secret Santa gifts decorating our living room corner. Finland vs. Sweden, the ultimate ice hockey match! Checking out the current state of our games. Getting ready for Secret Santa. Santa’s Little Helper on the right was too eager to stay still for the panorama photo. The final moments of the first ever ‘Peter’s Peppars’ gingerbread competition. The judge has the difficult task of evaluating the submissions. After the launch of our first User-Generated Content mobile game Big Bang Racing in the summer of 2016 our team went through massive changes. 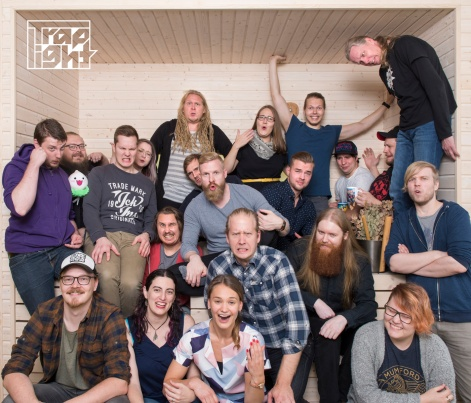 During 2016 and the beginning of 2017 Traplight grew from 13 to 25 people, and the tight group that once was just a single team working on one game was now separated into 3-4 small teams. This change brought us new challenges. We noticed that it was harder and harder to maintain great communication between different teams. After moving to a new office in July 2017, the teams got their long-awaited working space and peace, but the downside was that we were quite separated now. In the old, small office we were literally right next to each other all the time. Communication flowed then, but soon after moving to a larger office we realised that our communication was based on physical proximity rather than practices that were scalable. We needed something new to help us in this situation. We chat a lot with other game companies to share experiences and to learn. The idea of having weekly, casual and open-ended meetings came from our good friends at Space Ape. They have had a tradition of teams telling about their current progress during Friday afternoons. After hearing about this habit, we decided to make our own version of it. And so the Friday Open Mic meetings were born. Every Friday at 15.00 we gather in the living room for an hour of sharing. The teams took on this habit quickly and started to show their current product progress in the Open Mic. This turned out to be an excellent tool for keeping everyone up to date on what the teams are working on, and how they are doing. It’s also the perfect place for teams to ask feedback for everything from different art style tests to early game play prototypes. The fact that no progress is too small to show to others has encouraged everyone, and each presentation or talk is met with applause as a thank you. In addition to teams, everyone else can also step up and show things. More and more people have taken this opportunity to tell about their work outside the game teams (like marketing, support and analytics), or share things they have recently learned. All new game ideas are presented in Open Mic as well. The inquisitive and open atmosphere of the meeting has also encouraged us to bring up issues, worries and problems: It is a safe space where those kinds of things can be discussed. The idea of the Open Mic is to keep everyone on the same page and excited: Hearing, seeing and learning new things every week. It’s an amazing tool that we are constantly developing. Based on a recent round of feedback we, for example, set more defined time slots for each topic to make sure the meeting stays condensed and started to share notes from the meetings on a dedicated channel. We also decided that if interesting discussions start during Open Mic, those would be continued later in another meeting or after Open Mic has ended. Issues, problems and worries that are brought up are also treated the same way: If the problem is not solved in 10-15 minutes, it is acknowledged together and appointed another time for the solving or deeper discussion. All in all, the Friday Open Mic has been one of the best habits we have taken on recently. As simple as the idea is, it has done wonders for our communication, team spirit and collaborative effort to move towards the same goal. It has already caused other interesting habits to spin out of it and helped us to understand each other’s work and the company’s direction a lot better. To celebrate the occasion, PocketGamer has gathered a list of the Top 25 Finnish Mobile Game Companies on their website. Guess what, Traplight is on that list! Thank you PocketGamer for the honor, we are glad to be there among with other greats like Supercell, Seriously and our fellow Tampere based friends 10Tons. Cheers! Why Do Influencers Matter For Your Game? Traplight’s Community & Marketing Manager Veera Rouvinen spoke about Influencer Marketing at Aalto University’s Games Now lecture series today. The topic of the lecture was “Why Do Influencers Matter for Your Game, and How to Work With Them?” The lecture covers the basics of what influencer marketing means for games right now, and how can developers market their game in a way that benefits the influencer and their audience as well. Check out Veera’s lecture in the video below. You can also check out the slides of the lecture in this link.